Robert F. Black, Jr. is a distinguished Monmouth County, New Jersey defense attorney who focuses primarily on criminal law and civil litigation and has gained a stellar reputation for his skillful and tenacious advocacy on behalf of his clients. Deeply invested in his client’s well being, Mr. Black strives to be the best in the field of criminal law each and every day. He chooses to go the extra inch for all of his clients and sincerely views their success as his number one priority. When you hire Robert F. Black, Jr. to handle your legal matter, you get more than just an outstanding defense attorney, you get a loyal friend. Prior to working as a defense attorney in Monmouth County at The Law Offices of Robert F. Black, Jr., Rob was an attorney and managing partner at HANNAN & BLACK LAW GROUP. Prior to working at HANNAN & BLACK LAW GROUP, he was an Associate Attorney at Clark Law Firm, P.C. in New Jersey, was employed by Gutman, Mintz, Baker & Sonnenfeldt, P.C. in New York City, and served on the Board of Directors at the Unemployment Action Center (New York, NY). His trial experience includes indictable criminal offenses, DWI, municipal court, serious personal injury, employment law, and landlord-tenant disputes. Born and raised in Monmouth County, New Jersey; Rob attended The Maurice A. Deane School of Law at Hofstra University where he graduated with a Juris Doctorate degree. While at Hofstra Law, he served as President of the Unemployment Action Center (UAC), the largest organization in the United States devoted to the representation of unemployment insurance claimants. Prior to attending Hofstra Law, Rob graduated from Seton Hall University with a Bachelor of Science degree in Political Science. Robert F. Black, Jr. has received numerous individual accolades as a Monmouth County defense attorney and has consistently been recognized for his advocacy on behalf of others. 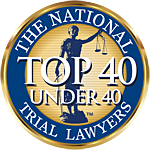 In 2014, Rob was nominated for The National Trial Lawyers “Top 40 under 40” membership, which is extended to 40 Lawyers in New Jersey each year “who exemplify superior qualifications, trial results, and leadership as a young lawyer under the age of 40.” Membership into The National Trial Lawyers: Top 40 under 40 is by invitation only, and is extended exclusively to those individuals who meet stringent qualifications and specialize in the legal practice of criminal defense or civil plaintiff. He has also been the recipient of several Avvo Clients’ Choice Awards and has an Avvo Rating of “Excellent”. Mr. Black is a member of the Monmouth County (NJ) Bar Association and the New Jersey Bar Association; he is admitted to practice law in the State of New Jersey and has passed the New York State Bar Exam. He is a member of The National Trial Lawyers and the National College for DUI Defense. Beyond advocating for justice, Rob enjoys spending time with his family, coaching youth basketball, playing golf, fishing and watching his favorite football team.